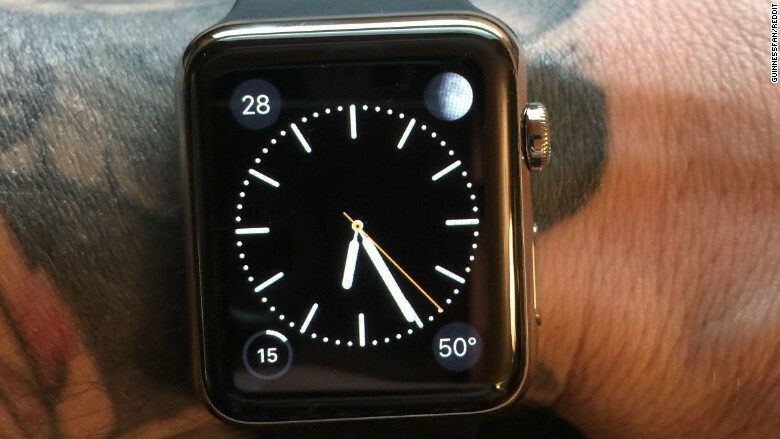 Apple confirmed Friday that tattoos can in fact prevent the Apple Watch from working properly. Specifically, the company said in an update on its support site that certain tattoos can interfere with the heart rate sensor on its smartwatches. "Permanent or temporary changes to your skin, such as some tattoos, can also impact heart rate sensor performance," Apple (AAPL) says. "The ink, pattern, and saturation of some tattoos can block light from the sensor, making it difficult to get reliable readings." Apple listed other factors that can affect the sensor's performance, including skin perfusion, or how much blood flows through skin. "If you're exercising in the cold, for example, the skin perfusion in your wrist may be too low for the heart rate sensor to get a reading," according to Apple. Some irregular movements, such as tennis or boxing, can also interfere with the heart rate monitor. "Rhythmic movements, such as running or cycling, give better results." Some Apple Watch owners took to Reddit and Twitter to complain about the tattoo issue earlier this week. Reddit user guinne55fan complained that his wrist tattoos interfered with the Apple Watch's sensor. The problem stems from the way the Apple Watch senses your heartbeat. According to Apple, the back of the watch rapidly flashes green and infrared light at your skin, which gets absorbed or reflected by your blood. When your heart beats, there is more blood in your wrist, while there is less blood between beats. By sensing the timing between your heartbeats, the Apple Watch can calculate your heart rate. As it turns out, solid-colored tattoos -- particularly red ones -- also absorb the green light and reflect red light. Black tattoos, which absorb both green and red light, can also screw up the Apple Watch's heart rate sensor. The Apple Watch works fine with dark-colored skin, scars and skin abrasions, which are translucent, allowing light to pass through. Tattoo ink is opaque, so that light can't penetrate your skin. "If you're not able to get a consistent reading because of any of these factors, you can connect your Apple Watch wirelessly to external heart rate monitors such as Bluetooth chest straps," Apple advises.